Bayan Token is structured as a Utility Token where it is being packaged creatively with multiple values and benefits to serve the Token Holders. Bayan Token aims to create GOOD for a GREATER GOOD for all. Please read the following notification properly before taking part in BYT token sale. This notice applies to all persons who read this document. Please note this notification may be changed or updated. 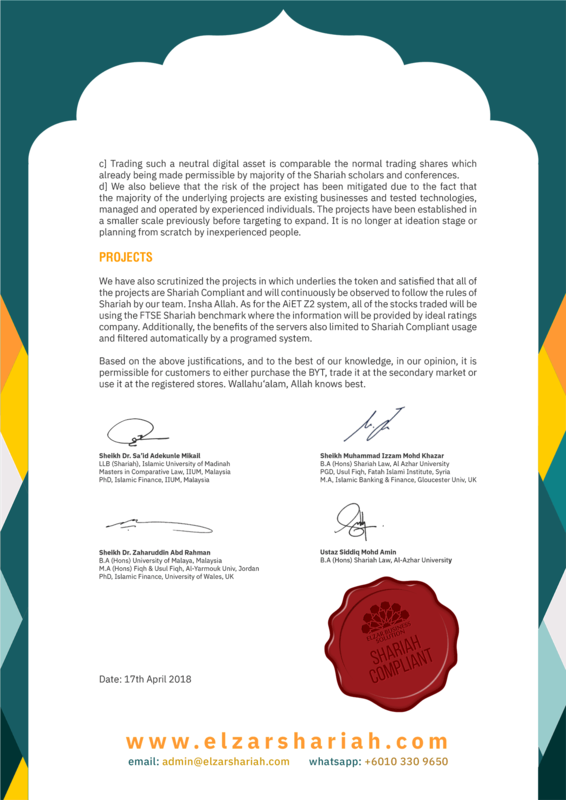 BYT token sale is carried out by BYT Technologies PTE. LTD., a company incorporated and existing under the laws of Singapore (“the Seller”). We also draw your attention, that the Bayan Token Whitepaper (“WP”) does not constitute any relations between you (“you or the Buyer”) and the Seller. Purchasing of BYT tokens does not present an exchange of cryptocurrencies or conventional currencies for any form of ordinary shares of the Seller and the Buyer of BYT tokens is not entitled to any guaranteed form of dividend. The Buyer is only entitled to certain rights within the T&C. 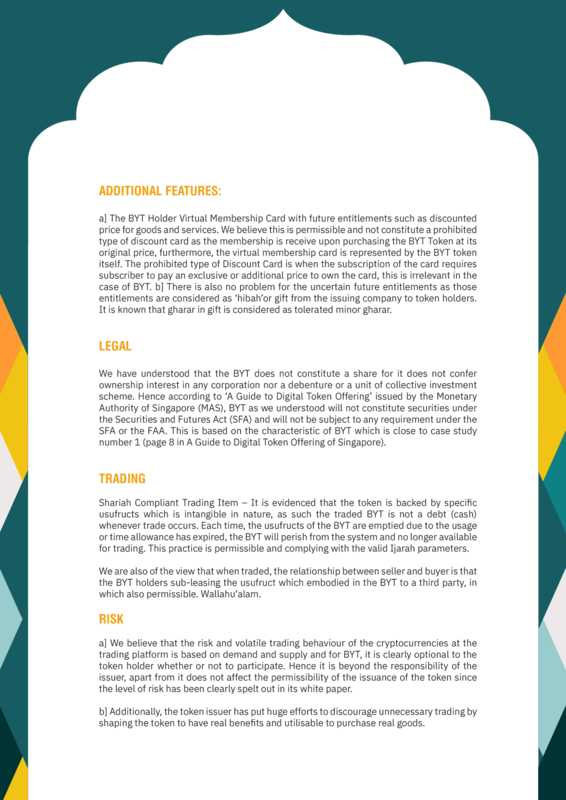 BYT tokens are not intended to constitute securities in any jurisdiction. Tokens will have no rights or functions attached to them, and will not grant the Buyer any ownership, voting or management right or interest in the Seller, or any right to receive profits, income or other payments or returns arising from the acquisition, holding, management or disposal of, the exercise of, the redemption of, or the expiry of, any right, interest, title or benefit in the Seller, the Seller’s property, or the Seller’s platform. WP does not constitute a prospectus or offer document of any sort and is not intended to constitute an offer of securities or a solicitation for investments in securities in any jurisdiction. WP is posted for information purposes only. The content of WP is not a financial promotion. Therefore, none of the content parts of WP should be considered an invitation or inducement to engage in any sort of investment activity. The Buyer should carefully consider and evaluate all risks associated with cryptocurrencies, operations with them, ICO and respective business activities. Before purchase BYT tokens read carefully all the information set out in the WP and ensure that you are aware of all potential risks. We strongly recommend you to seek out independent financial and legal advice before engaging in any sort of business endeavor. No regulatory authority has examined or approved any of the information set out in WP. No such action has been or will be taken under the laws, regulatory requirements or rules of any jurisdiction. The publication, distribution or dissemination of WP does not imply that the applicable laws of any jurisdiction, regulatory requirements, or rules have been complied. To the maximum extent permitted by the applicable laws, regulations and rules, the Seller and its affiliates and respective officers, employees or agents, in relation to the website (www.bayantoken.com), BYT tokens, BYT products and services will not be liable for any damages of any kind, including, but not limited to, direct, consequential, incidental, special or indirect damages (including but not limited to lost profits, loss of revenue or third party loss whether foreseeable or otherwise, trading losses or damages that result from use or loss of use of the website, BYT tokens, BYT products and services). For the avoidance of doubt, the Seller expressly disclaims any and all responsibility for any direct or consequential loss or damage of any kind whatsoever arising directly or indirectly from: (i) reliance on any information contained in this document, (ii) any error, omission or inaccuracy in any such information, (iii) any action resulting therefrom, or (iv) usage or acquisition of BYT products and services, available on the website and other electronic platforms. You confirm and agree that you are not purchasing BYT tokens for purposes of investment, speculation for immediate resale or other financial purposes. Some of the statements in WP include forward-looking statements which reflect the Seller's current views with respect to execution roadmap, financial performance, business strategy and future plans, both with respect to the Seller and the sectors and industries where the Seller operates. Statements which include the words ‘expects’, ‘plans’, ‘believes’, ‘projects’, ‘anticipates’, ‘will’, ‘aims’, ‘may’, ‘would’, ‘could’, ‘continue’ and similar statements are of a future or forward-looking nature. All forward-looking statements concern the matters that involve risks and uncertainties. Accordingly, there are or will be important factors that could cause the Sellers’s actual results to differ significantly from those indicated in these statements. 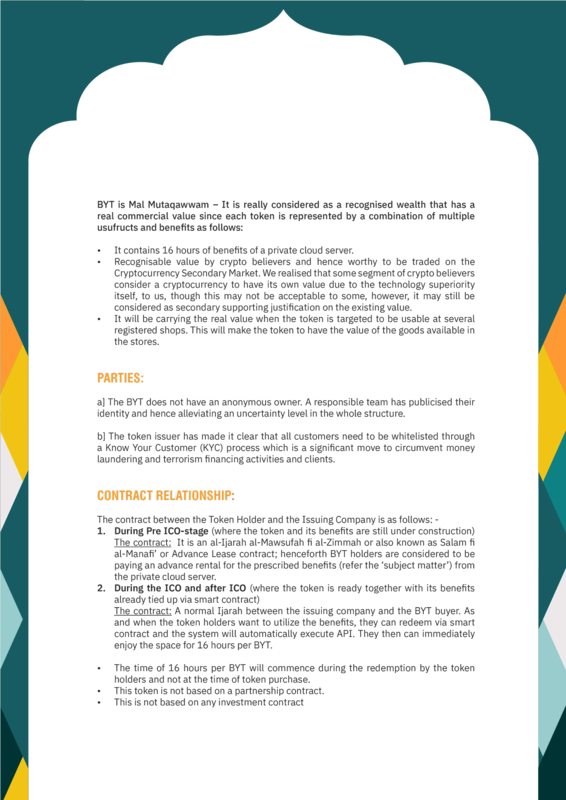 These factors include but are not limited to those described in T&C, which should be read before purchasing of BYT tokens. Any forward-looking statements in WP reflect the Seller's current views with respect to future events and are subject to these and other risks, uncertainties and assumptions relating to the Seller's operations, results of operations and growth strategy. These forward-looking statements are valid only on the date of WP publication. The Buyer should specifically consider the factors identified in WP and T&C which could cause actual results to differ before making a purchase decision. No statement in WP is intended as a profit forecast and no statement in WP should be interpreted to mean that the earnings of the Seller for the current or future years would be as may be implied in WP. As BYT token is utility token by its nature, there are no restrictions to sell them to residents of any country, unless the law of the Buyer’s country prohibits citizens of that country to buy digital assets of any kind. WP or any part thereof, as well as any copies, must not be taken or transmitted to any country where distribution or dissemination of such information is prohibited or restricted. 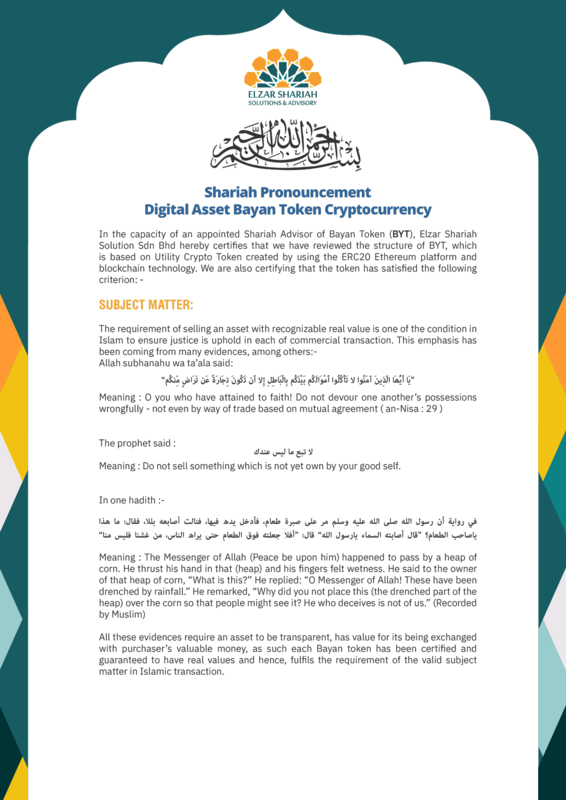 Copyright © 2018 Bayan Token. All rights reserved.